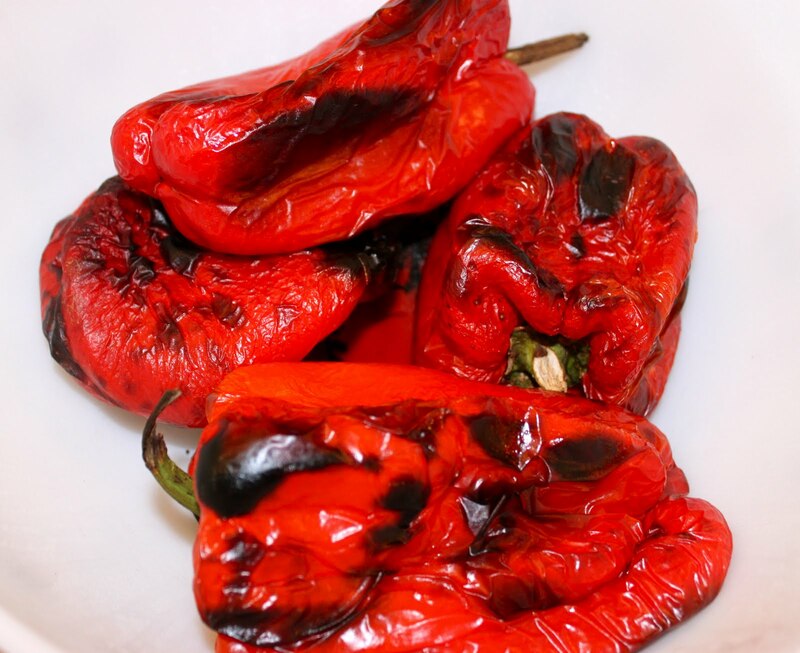 Roasted red bell peppers are great to add a layer of extra flavor in sandwiches, panini, pasta recipes, salads, and the traditional Italian antipasto platter. With the intent to continue to grow my own (you can’t get any more local than your own backyard or patio/balcony), I’ve enjoyed roasting my own and freezing them in small quantities. This way they are only an arm’s length away to use throughout the colder months. Wash the peppers and if they are store-bought, remove the sticker labels. If using a gas range, turn the burners on high and place the peppers directly onto the grates. Using tongs, turn the peppers for an even char. The peppers will hiss and bubble while the peppers’ moisture evaporates. If using a grill, the method is the same. However, if you’re like me and roast a lot of peppers at a time, then use the oven broiler setting. In all options, make sure that you continually turn the peppers over to ensure even charring. Preheat the oven on “Broil”. Arrange the peppers evenly on a baking sheet. Place in the hot oven on the highest rack position. Roast, while keeping a constant eye on them, turning them whenever necessary to prevent burning/complete blackening. 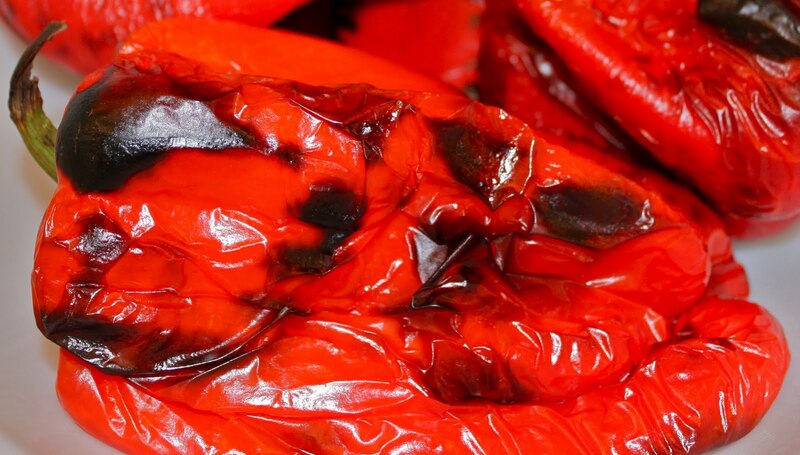 Once nicely roasted and charred all over, put the peppers in a bowl and cover with plastic wrap or a clean paper bag. Do not open or the steam will come out. Keep the peppers in the covered bowl or bag for 30 minutes to allow the steam to help loosen their peels which makes peeling them easier. Once the peppers have cooled, cut off the tops of the peppers. Cut into half and then into half again (quarters) . . . actually I simply pull them apart in sections where they ‘naturally’ separate into sections. Carefully peel or scrape off the charred skin with either your fingers or a sharp paring knife. Discard all peels, tops, and seeds or put in your compost pile. Do not rinse the peppers as the water diminishes the smoky flavor. When the skins and seeds have been removed, cover the peppers with olive oil, adding garlic slices, herbs or capers if desired, and refrigerate for up to two weeks. To freeze, I don’t put them in any oil. Below, for freezing, use zip-lock freezer bags, indicate contents and date, insert the peppers only (no oil), press lightly to remove extra air, and seal. Freeze. A simply gorgeous bounty . . . and this is just one of about 5 harvests thus far! I love love love them roasted, actually addicting for me! these instructions are awesome too! I roasted red peppers all day yesterday – all day. They are happily ensconced in my freezer for a taste of summer in the winter! Love the detailed instructions – hope everyone who sees this starts roasting! Yes, your detailed instructions are superb! Roasted peppers of every stripe are indeed a great addition to just about anything! Just about a staple anymore. You’re so lucky to have such a bounty — but, then again, you worked for it! I am growing peppers and just now getting my first produce. I having been looking for ways to preserve them since we can eat all of them now! Can the roasted peppers be used for anything? Curious what I can use them for this winter. Also, if I am freezing them do I still need to do the vinegar soak you do for 1 week? Once they have soaked do I put the liquid in the freezer bag or just the peppers? Thanks for the input and I cant wait to try this. Thanks for stopping by my blog and for you nice comments. I have been a follower of your blog for quite a while now, but I did just now connect with you on networked blogs. I am in awe of your blog…so well done and so professional. I feel a bit like Charlie Brown who was looking for pictures in the clouds with Linus…and after Linus remarks, “I see Washington Crossing the Delaware” Charlie says, “I was going to say I saw a yellow duckie!” I want to be like you when I grow up! I am inspired by your recipes and as a “granddaughter of Italy” appreciate your comments on Italian food and culture. My family is from Le Marche and Sicily. This is on my ‘to do’ list today. Looks absolutely perfect, I love peppers, as always love your recipes, hugs. Roz, I’m glad for your bountiful garden produce and the peppers look great! You’re such a good cook! Hope Irene left you alone, Roz. p.s. I invite you to join me for a new meme “Travels Near and Far” on the 15th of each month. Link up a big trip, or a trip to a local place of interest…whatever you’d like. Hope you can be there! Oh Roz, I absolutely LOVE roasted peppers. A sweet Italian lady, Nicolina, was the first person to teach me how to do them. God rest her soul. Yours look divine. I didn’t know they could be frozen, so thanks for telling me that. I think I’ll pick up a slew of them at the next Farmer’s Market I attend. 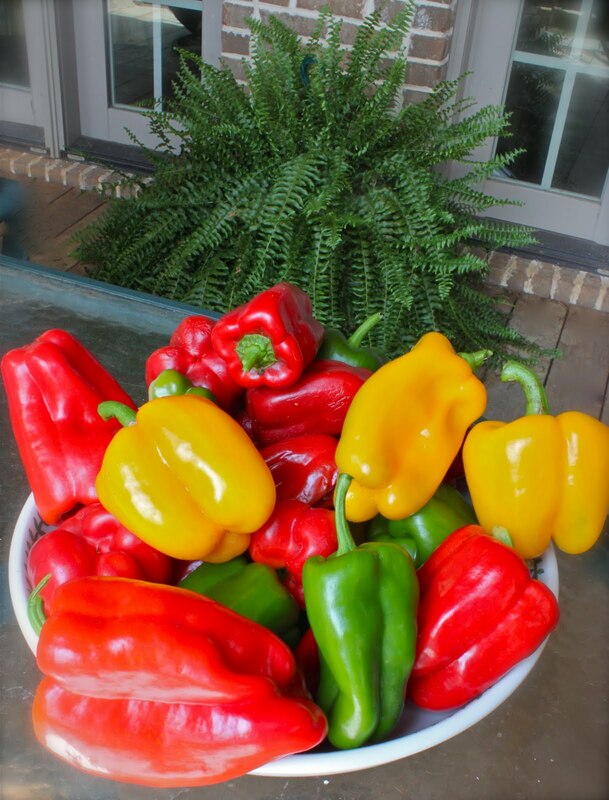 Roasted peppers throughout the winter sound good to me! Wow! Thanks for sharing! I’ve always wondered how to do this! They look fantastic and I must try this! I will definitely try the peppers your way! Thanks! I’ll be right over … for a few dozen. YUM! Yum, these look terrific! 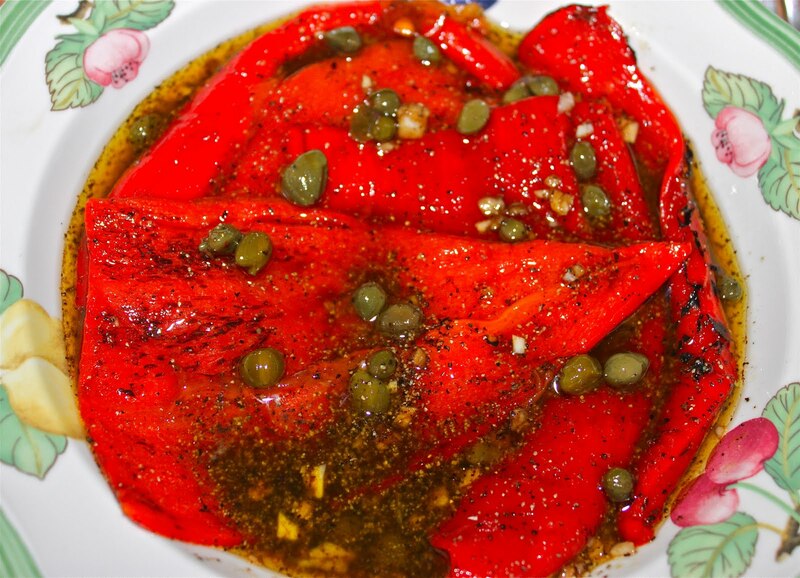 Roasted peppers add zing to any dish !